Diesel, A Bookstore in Oakland welcomes The Seated Diesels back to the store to discuss Thousand cranes by Yasunari Kawabata on Tuesday, September 25th at 7pm. With a restraint that barely conceals the ferocity of his characters' passions, one of Japan's great postwar novelists tells a luminous story of desire, regret, and the almost sensual nostalgia that binds the living to the dead. "A novel of exquisite artistry... and a story that is human, vivid, and moving" - New York Herald Tribune. Yasunari Kawabata, winner of the 1968 Nobel Prize for Literature, was one of Japan's most distinguished novelists. Among his major novels published in the US are Snow Country (1956) and The Master of Go (1972). He committed suicide in 1972. Orphaned at four, novelist and short story writer Yasunari Kawabata caught the eye of editors and writers in the 1920s with his spare, subtle, melancholic prose. After an experimental period from the mid- to late-1920s, Kawabata relocated to Kanagawa in 1934 and, in conjunction with his work as a reporter for Mainichi Shimbun, began to write his celebrated poetic novels. As one of the leading writers of postwar Japan, Kawabata continued to write as he founded new literary journals, promoted the translation of Japanese works into English, and mentored new writers, such as Yukio Mishima. In 1968, he became the first Japanese and East Asian to win the Nobel Prize for Literature. 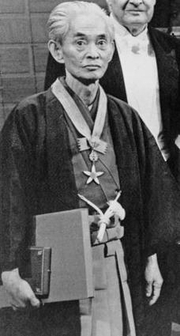 Yasunari Kawabata died in 1972. Yasunari Kawabata is currently considered a "single author." If one or more works are by a distinct, homonymous authors, go ahead and split the author. Yasunari Kawabata is composed of 40 names. You can examine and separate out names.